Chivalry is alive and well, and here’s the proof: send her this majestic mix of hot pink roses, white Oriental lilies and pink snapdragons, paired with a stylish glass cylinder vase. All you'll need to add is the shining armor. How can you say "love?" Let's count the ways. First, there's the wondrous arrangement of red & hot pink roses, lavender daisies, white Monte Casino blooms and hot pink mini carnations. Then there's the cute-as-a-button bear. And finally, the distinctive split wood basket. The color of the bear is dependent upon availability. Bears will either be brown, tan or white with a red bow tie. 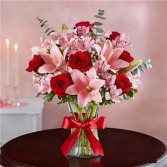 Let her know she’ll always hold the key to your heart with our magnificent Valentines arrangement. 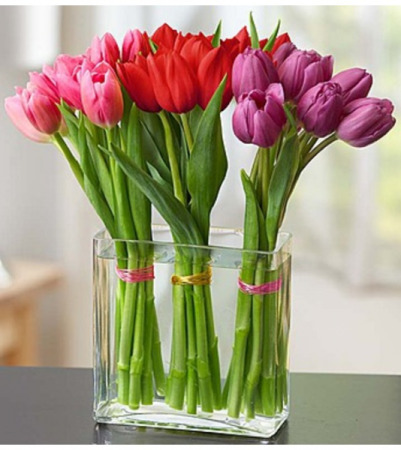 A show-stopping mix of radiant red & pink blooms, it’s hand-arranged inside a clear glass vase tied with a red satin ribbon. Let it unlock all the feelings you have inside without even saying a word. 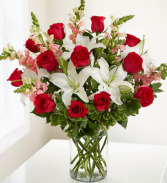 All-around arrangement of red roses, pink Asiatic lilies and Peruvian lilies (alstroemeria), gypsophila, accented with baby’s breath, spiral eucalyptus and assorted greenery To ensure lasting beauty, Asiatic and Peruvian lilies may arrive in bud form, and will fully bloom over the next few days.